With over 30-years of experience in the Automotive industry; (GM Master Technician and ASE Certified Technicians), we at Griffin Tools & Supply are uniquely qualified to meet your automotive equipment needs. We are your long-term partner and understand we must earn your support and patronage each and every time something is needed. There is no item or request too small, from Nitrogen Generators and Tire Inflation Products, Test Lead Kits and Brake Service Tools, MS5950 and the New MS6050 Universal Motorcycle Diagnostic Scan Tools, MS531-HD Diagnostic scanner and performance tuner, Eco-Friendly Floor Cleaners and Degreasers and the Eco-Friendly Smart-O Oil Drain Plug. Strong vendor relationships allow Griffin Tools & Supply to be as competitive as anyone! Through our alliances with our world-class manufacturers and other distributors, we can get you almost any piece of equipment for your facility. Our main focus over the past several years has been Motorcycle Diagnostic Equipment. We have assembled a complete line of Universal and Manufacturer Specific scan tools and tuning products, products include the Universal Scanners from Motorscan MS5950 and MS6050, the MS531-HD for Harley Davidson and the MS531-BMW for BMW Motorcycles. Tuning products include the MS531-Tune, a unique tuning system for Harley Davidson and the SPB (Smart Power Bench) Motorcycle Dyno for DYNO tuning and Performance measurements. Factory trained in undercar products including Automotive Lifts, Alignment Machines, Tire Changers, Wheel Balancers, and Nitrogen Tire Inflation Systems. If you don’t see what you’re looking for just give us a call or send an E-mail, we should be able to find what you need! The griffin, is a legendary creature with the body of a lion and the head and wings of an eagle. 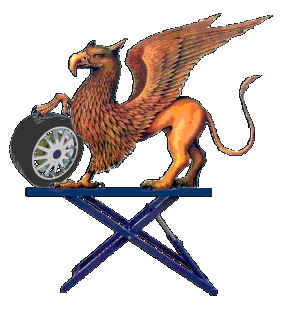 In heraldry, the griffin's amalgamation is used to denote strength and military courage and leadership. Griffins indicate that one must combine intelligence and strength. Be sure to visit our current specials page for special promotional prices on select products.